It had been at least a good year since I last picked up a Target Beauty Box, though there have been a few that have caught my eye including one from last month that had a Cover Girl mascara. But it wasn't until I saw this Sonia Kashuk box that I immediately jumped out of my bed to place an order. FYI: I had ZERO idea that this box was coming out and only found out via email from Target. I had a feeling that this box would sell out rather quickly, so I didn't even wait until I took the kids to school, instead I immediately sat down and ordered two of them. The price of the Sonia Kashuk Target Beauty Box was $10 and that week target was running a spend $20 on beauty get a $5 gift card promotion. That prompted me to order a second (there was a two box limit) so that I could score the gift card. My order did take a full week and a half to deliver, which felt absolutely eternal. Target hit a snag because they had run out of the gift cards, so instead they only charged me $16.16 after tax. At the end of the day that was an even better deal. 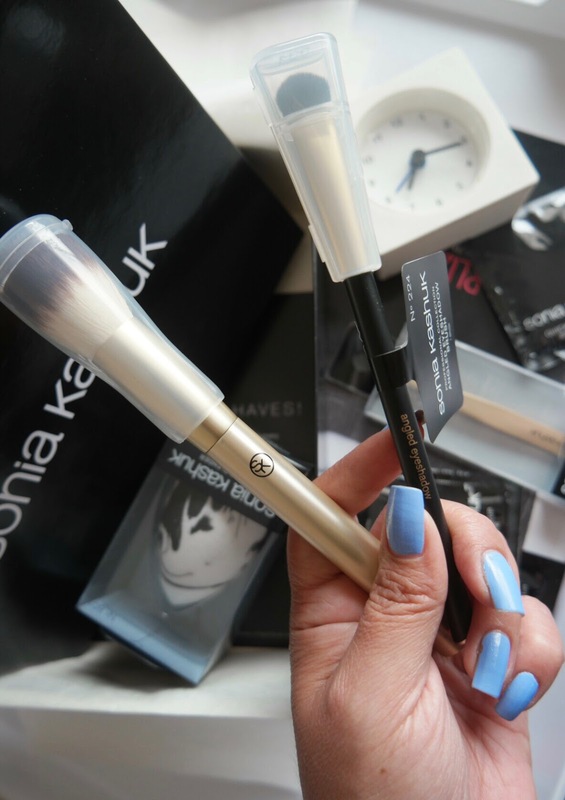 Ever since the revamp of the entire Sonia Kashuk range, I have seen them in stores and have held a few of the brushes wondering which one I should pick up. I'd been especially interested in the makeup sponges since everybody is raving about them on social media. Just 2 days prior to this deal, I had been looking at a duo of the makeup sponges at Target, which is only $10, making them a better deal than my favorite L'oreal sponge. First of all I was super excited to see that we got two brushes, and that one of them was not a flat liner brush. In this box we got a blush brush and an eyeshadow brush, each one from a different part of the range. The black brush is from the more expensive line and the gold comes from the more affordable range. I like that we have two different options for Sonia Kashuk brushes, depending on how much you want to spend. This beauty box was a great way to get a feel for the new line of tools for sure. Sonia Kashuk Blush Makeup Brush: At only $9 this is a really nicely priced brush, especially for how beautiful the design and how soft the bristles are. You can use this brush for blush, contour and bronzer, and it blends everything so seamlessly. I will definitely be looking into more brushes from this range. Sonia Kashuk Angled Eyeshadow Brush: At $13 this brush is on the pricier end of the drugstore spectrum but it's beautiful and very soft. This brush is for depositing shadow and blending the crease out with ease and can be used for both cream and powder products. I love that both brushes came with protectors, meaning they will be brushes that I travel with. Have I mentioned how much I love the sleek and really high-end look of these brushes. Just check out this detail. 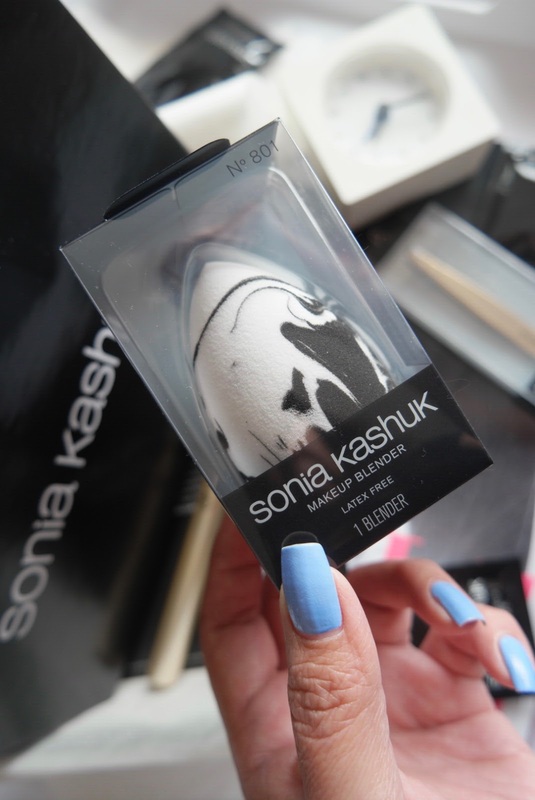 Sonia Kashuk Marble Makeup Blender Sponge: This sponge is priced at $7 for a single or you can score a better deal by purchasing the 2-pack for only $10. I've not tried this yet but it's the item I was most excited for in the box. I hope it lives up to the hype! Sonia Kashuk Slant Tip Tweezers: These tweezers are priced at $10 and are really nice looking. I don't know that I have ever spent $10 for a pair of tweezers, I tend to be really cheap about this part of my beauty regimen and will only buy the ones under 5 bucks. I do have some nice ones I have received in beauty boxes and this will be a great addition to my collection. Sonia Kashuk Quick Dry Makeup Wipes: A pack of 10 of these wipes is priced at $9 and we received three singles in this box. These wipes work really well and smell really good, but you have to be quick because they dry quickly. I can see the wipes being a great option for travel, much easier to pack to any other kind of cleaner and they are really efficient and quick. They are a little pricey for me so I don't think I would ever buy a pack unless I was traveling for an extended amount of time. They are a really cool concept though. I love the design of both of the brushes we received in this box. I have a feeling that this is only the beginning of my new Sonia Kashuk Brush Collection. I have some from earlier sets but none that I love, these def seem to be much better in quality. I paid $15 for a Sonia Kashuk Box for myself and one for my daughter, which was an amazing deal. I have zero complaints about the items that I received. Usually when I purchase these type of beauty box there will be one or two products that I am not excited about, but this box was a definite winner. The Target Sonia Kashuk Box sold out within a few hours of going live, unfortunately you are not able to purchase it anymore. But I have linked each separate item above for your convenience. *Purchases made through the affiliate links in this post go directly to supporting this blog and bringing you more swatches and reviews. Thanks so much for your support!